Perpetually covered in ice and snow, the mountainous Antarctic Peninsula stretches southwardd towards the South Pole where it merges with the largest and coldest mass of ice anywhere on the planet. Yet far from being an otherworldly “Pole Apart,” the region has the most contested political history of any part of the Antarctic Continent. Since the start of the twentieth century, Argentina, Britain, and Chile have made overlapping sovereignty claims, while the United States and Russia have reserved rights to the entire continent. The environment has been at the heart of these disputes over sovereignty, placing the Antarctic Peninsula at a fascinating intersection between diplomatic history and environmental history. 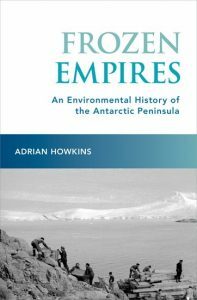 In Frozen Empires, Adrian Howkins argues that there has been a fundamental continuity in the ways in which imperial powers have used the environment to support their political claims in the Antarctic Peninsula region. British officials argued that the production of useful scientific knowledge about the Antarctic helped to justify British ownership. Argentina and Chile made the case that the Antarctic Peninsula belonged to them as a result of geographical proximity, geological continuity, and a general sense of connection. Despite various challenges and claims, however, there has never been a genuine decolonization of the Antarctic Peninsula region. Instead, imperial assertions that respective entities were conducting science “for the good of humanity” were reformulated through the terms of the 1959 Antarctic Treaty, and Antarctica’s “frozen empires” remain in place to this day. In arguing for imperial continuity in the region, Howkins counters the official historical narrative of Antarctica, which rests on a dichotomy between “bad” sovereignty claims and “good” scientific research. Frozen Empires instead suggests that science, politics, and the environment have been inextricably connected throughout the history of the Antarctic Peninsula region—and remain so—and shows how political prestige in the guise of conducting “science for the good of humanity” continues to influence international climate negotiations. This is the story of an extraordinary job, in an extraordinary place. As one of the rangers, Michael Anderson was there to eradicate the cats and control the rabbits. 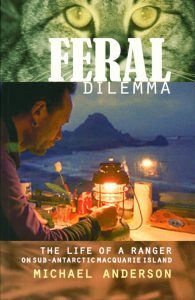 Feral cats, European rabbits, black rats and house mice were introduced to Macquarie Island back in the sealing days. Sub-Antarctic Macquarie Island is a thin sliver of land cast adrift amidst the worlds greatest ocean, 1500 kilometres south east of Hobart, Tasmania. The plateau that stretches most of the length of the island slopes steeply to narrow coastal terraces and storm-lashed, rocky shores. The climate is vicious: an average 280 days of strong wind a year, 90 days at gale force. On most days some form of precipitation falls, whether rain, drizzle, hail or snow. In summer the island is home to around four million penguins and tens of thousands of seals, as well as albatrosses and several species of burrow-nesting seabirds. Details the Antarctic diaries kept by Cecil Thomas Madigan whilst a member of the Australasian Antarctic Expedition from 1911-1914. 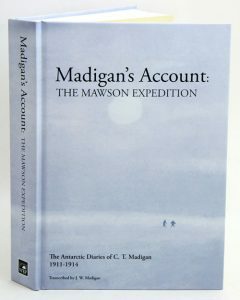 Madigan gives his account of the first year at the main base at Cape Denison; of the wondrous environment he found himself in, the living conditions and relationships formed, the care of the polar dogs, the hardships endured and the happy times enjoyed, and the preparations for the four main sledging journeys of exploration which were the principal reason for the expedition. Due to unforeseen circumstances Madigan was required to stay in Antarctica for a second year, the account of which couldn’t be more different from the first. This book details the historic race to become the first team to reach the South Pole. On 2 December 1911, Sir Douglas Mawson left Hobart on his Australasian Antarctic Expedition to explore the virgin frozen coastline below Australia, 2000 miles of which had never felt the tread of a human foot. He was on his way to fulfil a dream he had first conceived three years earlier, while on his first trip to the frozen continent on the Nimrod expedition under the leadership of Sir Ernest Shackleton. Even as Mawson and his men were approaching Antarctica, two other famous Antarctic explorers were already engaged in their own expeditions. While Roald Amundsen of Norway, with his small team, was racing with dogs along one route, England’s legendary Scott of the Antarctic, with his far larger team, was relying primarily on ponies and ‘man-hauling’ to get there along another. 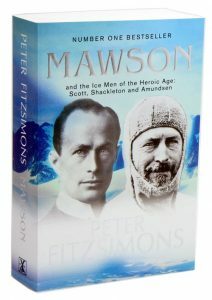 As Mawson and his men make their home on the windiest place on earth and prepare for their own record-breaking treks, with devastating drama to be their constant companion, the stories of Amundsen and Scott similarly play out. With his trademark in-depth research, FitzSimons provides a compelling portrait of these great Antarctic explorers. For the first time, he weaves together their legendary feats into one thrilling account, bringing the jaw-dropping events of this bygone era dazzlingly back to life. Also available in hardcover see [stock id 34914]. 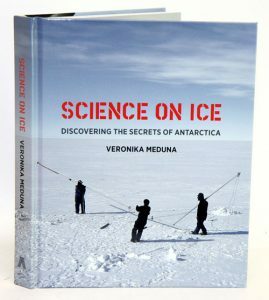 In this book, award-winning science broadcaster and writer Veronika Meduna follows scientists who dive under ice to study ancient mud, fat fish, migrating penguins and fossilised forests. Meduna presents us with a fascinating frozen land whose layers of ice and sediment record past climate conditions going back millions of years, and the oceans around it drive the global food chain and a giant conveyor belt of currents that transports heat around the globe. The creatures that call Antarctica home have evolved to survive in conditions hostile to life, and the continent’s permanently ice-covered lakes may even hold the secret to how life began on Earth. And though it is the only continent without permanent human habitation, Antartica may yet hold the key to our survival. In this lavishly illustrated book Meduna introduces us to an exhilarating landscape, to fascinating discoveries and to the people making them – those scientists tackling fundamental questions about life and the world around us from the frozen continent. 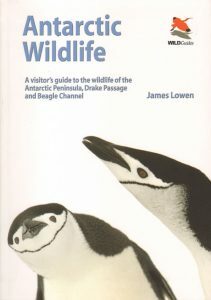 Antarctic wildlife: a visitor’s guide to the wildlife of Antarctic Peninsula, Drake Passage and Beagle Channel. A comprehensive photographic field guide featuring detailed species profiles and tips for easy identification. 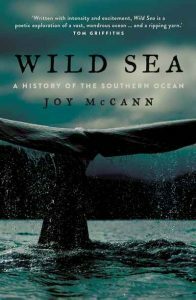 This book aims to help visitors to this remarkable part of the world identify with confidence any bird or marine mammal they encounter during their journey from the tip of South America to Antarctica. Also includes information on the Antarctic environment, tourism and how to get the most out of your trip.